Have you ever woken up during a dream so fantastic that you play Olympic javelin with your alarm clock so you can go back to sleep for more? Yeah, we understand. REM Sleep Cycle is such a tease. But it’s great when these prized dreams sneak back into shut-eye from time to time. What’s your favorite recurring dream? 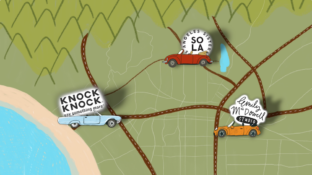 Tell us in our latest contest! 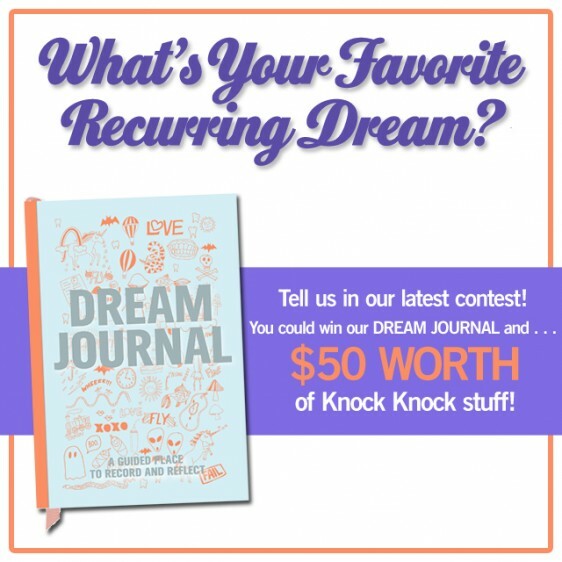 We’re giving away our new Dream Journal and $50 worth of Knock Knock stuff to the entrant we deem “top dreamer.” See below on how to enter! 1. Please read our contests’ Official Rules Page. 2. Click the “View” button at the top of this post. 3. Enter a comment in the comment field describing your favorite recurring dream. (You’ll need a free account with Facebook, Yahoo, AOL, or Hotmail to submit a blog comment entry). The contest starts today and closes at 11:59 PT on Friday, November 22. Grab a pillow, check out our other sleep stuff, then get to entering!